Me on my green quad bike. New Year’s 2013 I embarked on a trip with 4 friends to Egypt after visiting Jordan. 4 Canadians and 1 German, all laid back workmates, made for a good mix of adventure and shenanigans. 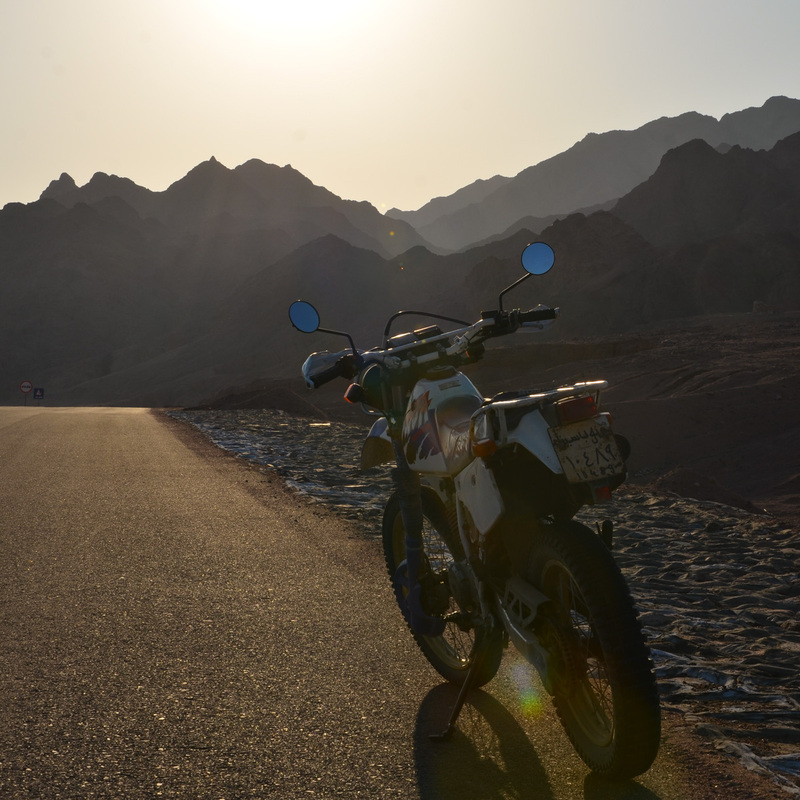 Our itinerary took us to the coastal town of Dahab on the Sinai Peninsula. Dahab is well known for its windsurfing, diving, free diving and snorkeling. Its nearby Blue Hole has some stunning coral and plenty of colourful sea life. 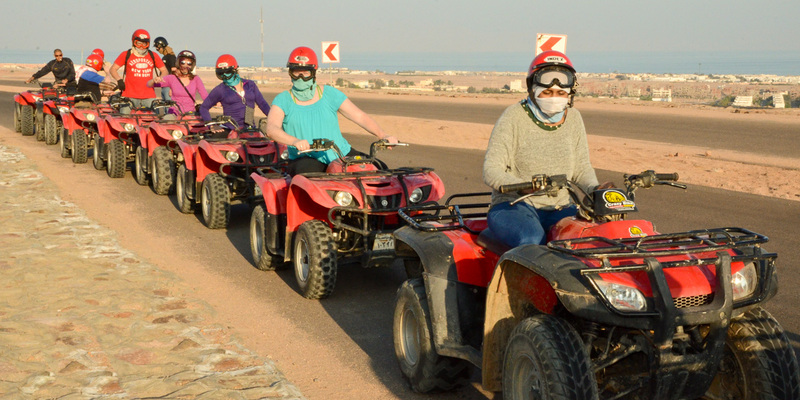 There is also lots to do ashore: camel rides, horseback rides, mountain biking and various motorsports in the sand dunes. We had some downtime and one of my mates suggested we rent quad bikes. I was all for leaving the resort-like part of town and heading into the desert so we walked down to the hire shop. 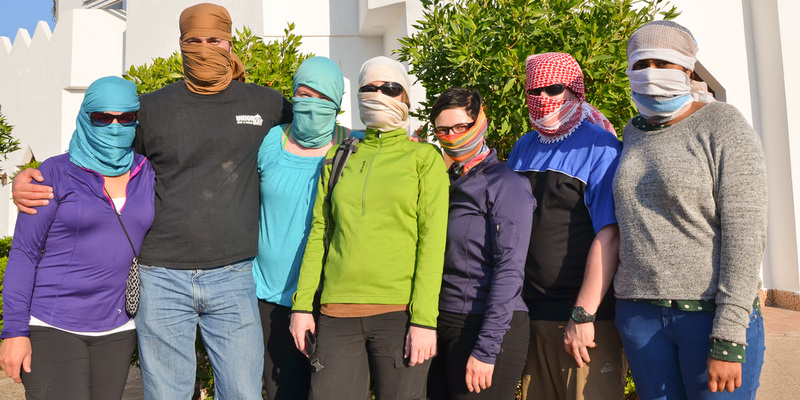 Advised in advance to bring scarves and sun glasses, the two young guides immediately began wrapping up our faces leaving only eye holes. I took this to be a good sign of the dust to come. He looked at me then looked at the large green quad bike in front of all the red ones. That was the one I was subsequently assigned. Once everyone learned how to work the automatic machines, we were off. My friends all lined up. I answered, “Yes, a bit but more on motorcycles” and I pointed to his bike. He points at his bike to confirm what I said and I repeated my yes. I nodded my head for emphasis. He nodded his head and smiled at me. Shortly after, the group caught up and we were off again. We drove around for a couple more hours into the expansive desert. At the base of some mountains we came across some Bedouin tents where we were signalled to pull over. That would be our tea break so I dismounted and met my dusty grinning friends. They too were having a good time. Before we entered the tent, the lead guy called me over. I thought I misunderstood. I asked if he said I could take his dirt bike for a spin. He smiled a big smile and nodded his head up and down. I got on, and off I went. There were no restrictions of being in town, there were no roads or even other riders. I was on my own zipping around the soft sand in the open desert. The feeling on two wheels was so much better than four. The back tire slipped around behind me and the bike responded quicker. It was so much lighter on the turns too. I was almost sad when I mounted my quad bike to leave after our break. The lead guide came over, flashed his smile at me again, and then switched my quad bike to manual. The ride home was just fine.